Non-Muslim in Cikahuripan disallow for praying in their home. 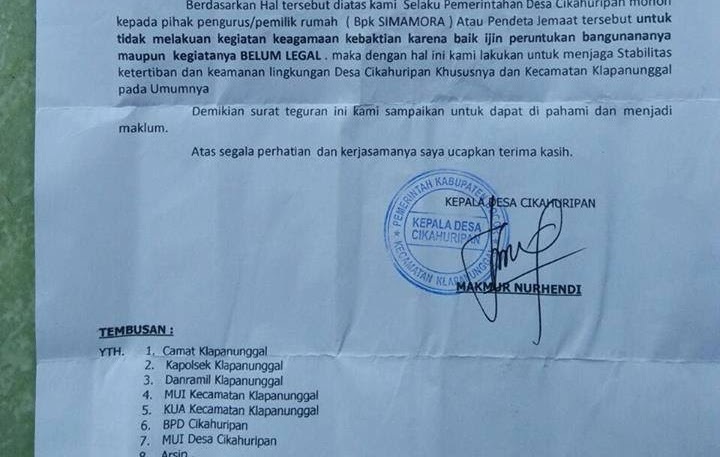 In this letter, it is specific addressed to Christian people to not praying in their houses in Cikahuripan. Cikahuripan is in West Java, just to the North of the city of Bandung, Indonesia. Because there are some very beautiful natural features nearby, such as the "green canyon", it is also a tourist spot, but a lesser known one. Yes I too thought the same after seeing the language used.Now does 'Kepala desa Cikahuripan' actually mean Cikahuripan,the country of skulls going by my arbitrary translation of Sanskrit/Prakrit and assuming those Bahasa Indonesia words to be derived from Sanskrit/Prakrit and not Arabic? I wasn't translating word Cikahuripan,but rather words kepala desa.What exactly do those words mean in that Sunda language?Are they words of the native/indigenous language or loan words from Sanskrit/Prakrit? Garudaman have you plagarised your nick from the Hindu text of Garuda Purana/the Eagle Purana that supposedly exists to install fear amongst believing Hindus about various punishments that await them after their death for the various sins that they have committed in this life? NS, "garuda" means "eagle" in Indonesian. It is also the name of the Indonesian National airline, which is, btw, REALLY incredibly good and not too expensive either. Garudaman is from Java, I think. manfred wrote: NS, "garuda" means "eagle" in Indonesian. It is also the name of the Indonesian National airline, which is, btw, REALLY incredibly good and not too expensive either. Garudaman is from Java, I think. Garuda is the name of the mythological eagle god in Hinduism who is the chief means of transportation for Hindu God Vishnu.Perhaps even after giving up Hinduism,Indonesians in whom the Sanskrit loan words still remain in vogue and are recently being displaced by Arabic continued to use the word 'Garuda'. it is the standard word for "eagle", NS, as it has for centuries, and the religious connection is not really known to most people in Indonesia. It's just the animal, plain and simple. The reason why there are some Sanskrit words in the Indonesian language is because the whole archipelago was Hindu until the Muslims arrived. There are also a lot of Arab words, mostly connected to religion and law, and many Dutch ones, mostly around technology and transport, but also in the food area. Must recent arrivals are English ones, which are often around information technology and internet, but also fashion and such. Sanskrit term have persisted in areas like the calendar and maths, in some religious terms, and also sometimes in the names of people. Now there seem to be many in this forum who are well-versed in Bahasa Indonesia. Can't they explain the real translation of words Kepala desa? Now in the Sanskritised Telugu of contemporary subcontinent, Kapala means head part of human skeleton while desa means country. Just like Manusmriti lent itself to amendments based on the factors of place and time, Sanskrit words also seemed to have got adapted to different meanings. Last edited by Nosuperstition on Sat Jul 28, 2018 8:51 am, edited 2 times in total. Kepala comes from word forehead or temple part of head in Gujarati language. It is pronounced as Kapal.Must be of sanskrit origin.erent English speaking countries. Same sanskrit origin word has different meaning in different regional languages of India.